The monsoon has set in and I am enjoying Vizag weather since the past two days. It isn’t pouring yet, just a few showers during the night and one wakes up to pleasant, cool and windy weather. The landscape outside my bedroom window is spectacular. After Nehal left for school (his first day after summer vacation) this morning, I sat outside with a cup of hot tea, reading the newspaper and enjoying the weather. I was also in a mood to bake and prepared a quick basic eggless cake for Nehal. 1 Pressure cook moong dal, ridge gourd pieces with 2 cups of water and turmeric pwd upto two whistles. Turn off heat and cool. 2 Add the coconut paste and salt to the cooked dal-ridge gourd mix and combine well. Add a small cup of water at this stage, if required, for a thinner consistency. Cook on medium flame for another 15-20 mts. The texture should be slightly thick and not watery. 3 In a pan, add ghee or oil, add mustard seeds and let them pop, add urad dal and let it turn red. Add curry leaves and asafoetida and stir fry for a few seconds. 4 Add the tempering to the simmering dal and combine. Turn off heat, place lid and leave covered for few mts. 5 Serve with hot rice or rotis. Beerakai pesara pappu kootu is a good dish, surely will try this. Thank u for sharing. Vegetables and pulses! Looks very healthy and delicious. I love it ..it is a simple and healthy dish with bare minimum spices. simple and easy dish yet so very healthy and delicious. Looks yum.. My MIL adds little bit miriyalu powder instead of green chilli paste. Its a different taste.. This recipe looks good. It has been cloudy and from time to time some drizzle in New York. I will try this Kootu. With best wishes. 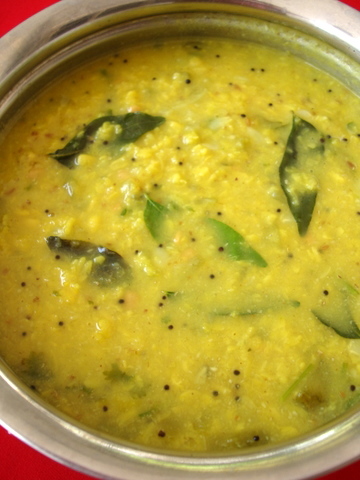 We also generally prepare beerakaya pesarapappu kootu. But we dont add coconut in it. After adding coconut paste, it is simply superb. Thank you very much. I love it. Wow , Pesarapappu is my favorite lentil and beerakaya is my favorite vegetable. This is a MUST try for me. Thx for sharing this. This is what I made for dinner yesterday to pair with vankaya vepudu….it was great. I did not add coconut though…. Sailu, Is there any technique to choose the right ridge gourd ? Every time i buy ridge gourd at least one out of 3 turns bitter. If you have any tips please share, thanks in advance. Thank you Sailu, will try your tip next time i go shopping. Today my wife cooked birakaya pesara papu .It;s too bad.i never heard this receipe in my lifetime. Love the dal and ridge gourd combo. 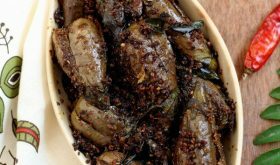 i like your all recipes they are delicious, and in this recipe you told to make a paste of grated coconut,greenchilli,cuminseeds, can you please tell we need to use the fresh coconut or the roasted coconut powder and the cumin we need to roast them and make a paste or not. Fresh coconut. No need to roast cumin seeds. I was never a fan of ridge gourd.. I tries this recipe of yours and voila.. I’m in love with the dal..It is so yummy and I told my mum back in India to try it out.. I was really amazed by the amount of detail you put into your recipes..That is what makes you different from the hundreds of other blogs.. I don’t know cooking, but followed your recipe and it turned out very well … it looks like you pictured it. Yummy. Thanks Sailu ! !